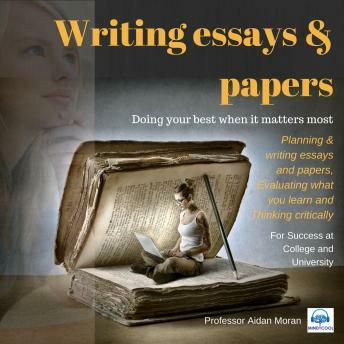 Aimed at students in college and university, this new audio single "Writing Essays and Papers" is taken from the bestselling album: "Learn to Study" by Professor Aidan Moran which teaches students the most important study skills for success at college and university. No matter what subjects you are studying in university, you will be expected to write essays and academic papers as part of the requirements of your degree programme. These research assignments are valuable because they train you to focus your thinking on a topic, to write clearly, and to cite appropriate evidence to support your arguments. So, the purpose of this section is to provide some practical advice on planning, researching and writing academic essays and papers. One of the biggest challenges that students face in coming to College is learning to think critically about what they read or are told. For centuries, the ability to think for oneself has been proclaimed as the main goal of a university education - the true mark of an educated mind. In keeping with this idea, a key theme of this audio presentation is that you have to become an active learner rather than a passive sponge in order to get the most out of your College experience. But critical thinking, or the skill of analysing evidence and arguments in order to form your own conclusions, requires hard work and special training. So, the purpose of this section is to provide some practical tips on how to develop your critical thinking skills. After I explain what thinking is, and what critical thinking involves, I'll give you a 6-step checklist of questions to ask every time you want to evaluate a theory or an idea.